love the frosting recipe..looks so delicious..
Wow Priya, your pumpkin muffin looks so soft and yummy. I love your frosting. Cute & interesting cup cakes & pretty frosting!! Wow! These are so tempting! Lovely! Healthy & delicious muffins..yummy frosting too!! Those cupcake looks tempting n cute!! What a perfect treat for the holidays!! Beautiful work, Priya! Looks great!!! Love the frosting,loos so colorful and delicious. love this simple yummmy recipe.. The frosting sounds so delicious, simply tempting..
Tes cupcakes sont très jolis et doivent être délicieux. J'en croquerai un avec plaisir. Cute cupcakes.. They look so yummy!! Very colourful and gorgeous cupcakes dear. Wonderfully made. Priya, this is delicious, love that frosting, I like your sweet helper helping with frosting part. Yummy. loved your orange frosting ...so inviting. I like the way every blogger has added their individual touch to the pumpkin muffins. Very nice! The bright frosting is a great touch! Well done! Another great recipe Priya! I would so love to try some. Priya the cupcake looks delicious dear yum yum. Those are gorgeous, Priya! 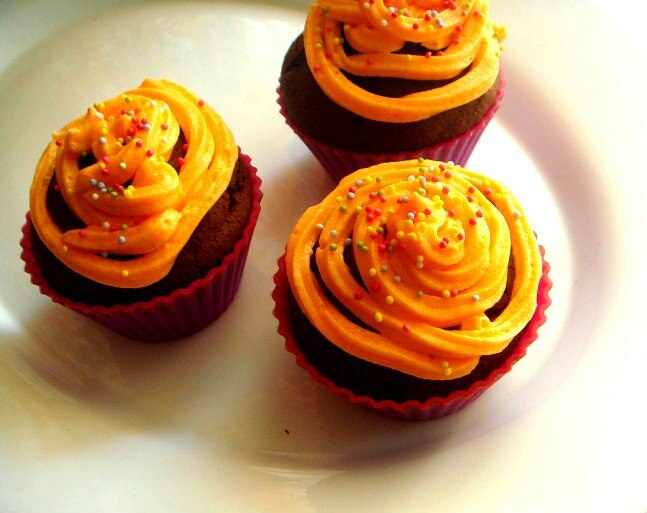 Love the dark orange color of your frosting! It makes your cupcakes even more perfect for fall! happening for 9 days of Navratri"